With this set, we honor Isis and Osiris. We will invoke these two influential deities as we book passage on the wing of a falcon-god and astral travel back to the ancient Egyptian pantheon. Come along, it’s going to be a wonderful ride. Isis is a powerful queen and ancient goddess of Egypt. She is the mother of Horus, patron of magic, leader of women, symbol of divine motherhood and matrimony. Her love for Osiris is the stuff of ancient legend, perhaps the greatest eternal love story of all time. Her magic is of memory and remembrance. She holds the direction of East and the element of wind, and as such she creates movement across time boundaries. She is past, present, and future. 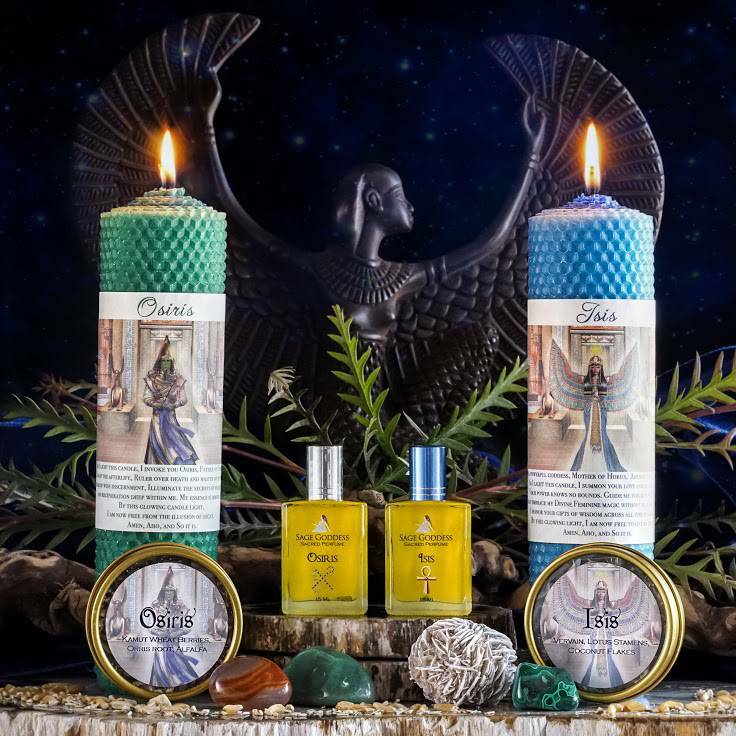 As we honor Isis and Osiris, we will summon our own ancient abilities and recognize the depth of our feminine power as well as the expanse of our masculine energy. We will also invoke Osiris, father of Horus, God of the afterlife, ruler over death and master of renewal. The bringer of wise discernment, Osiris can illuminate the secrets of resurrection and regeneration deep within us. We are both of these dualities in one, always working in synchronicity with the Universe. Our essence is immortal and our soul’s grasp is limitless. With this offering, you can choose to purchase the Isis and the Osiris set together, or you can choose to purchase either one individually. Order your tools as you feel called, but keep in mind that these two are an energetic pairing and their energy is meant to be worked with in unison. 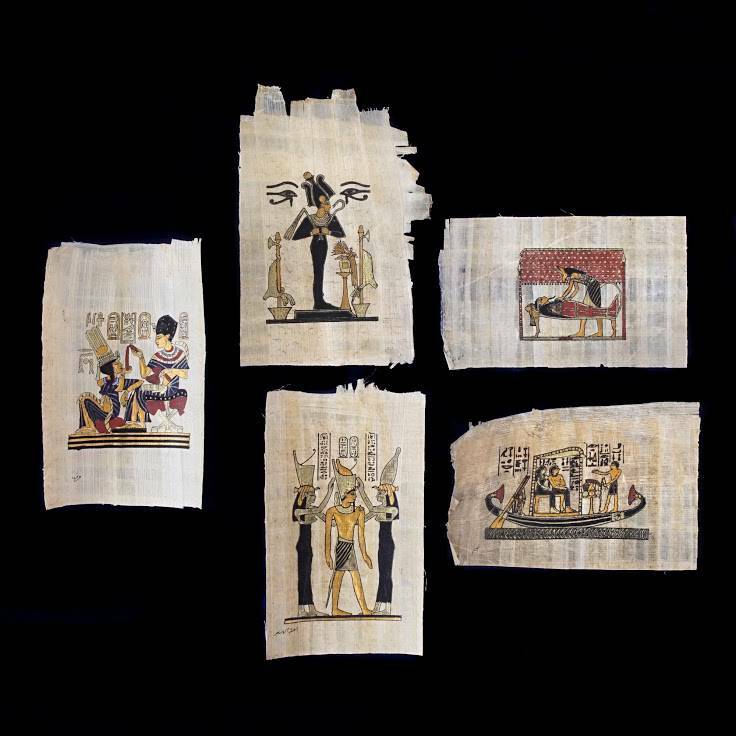 As an added gift, if you choose to purchase both sets together you will receive an authentic, hand-crafted, Egyptian papyrus adorned with an impeccably rendered, painted pictograph just like the ones the ancients used to make to visually transcribe their history, and honor their gods and goddesses. The papyrus came from our Egyptian friends at the Tucson Gem Show and each one is unique unto itself. No two are alike. This is a very special full moon offering, and only available in limited quantities. 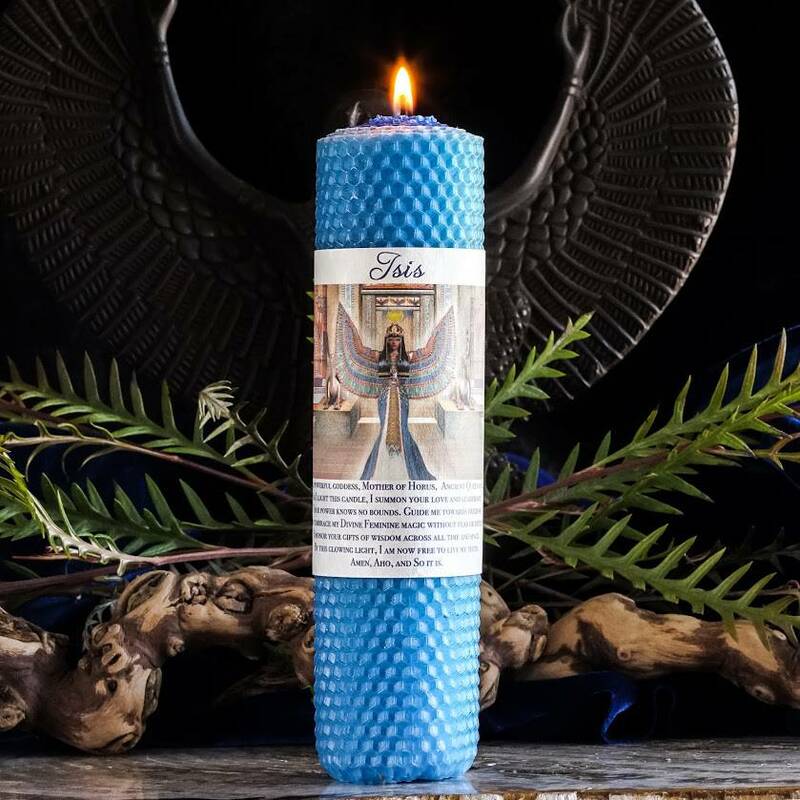 My Isis set comes with an Isis pillar candle, made with sheets of organic beeswax in electric blue and light blue and infused with an amazonite chip stone. 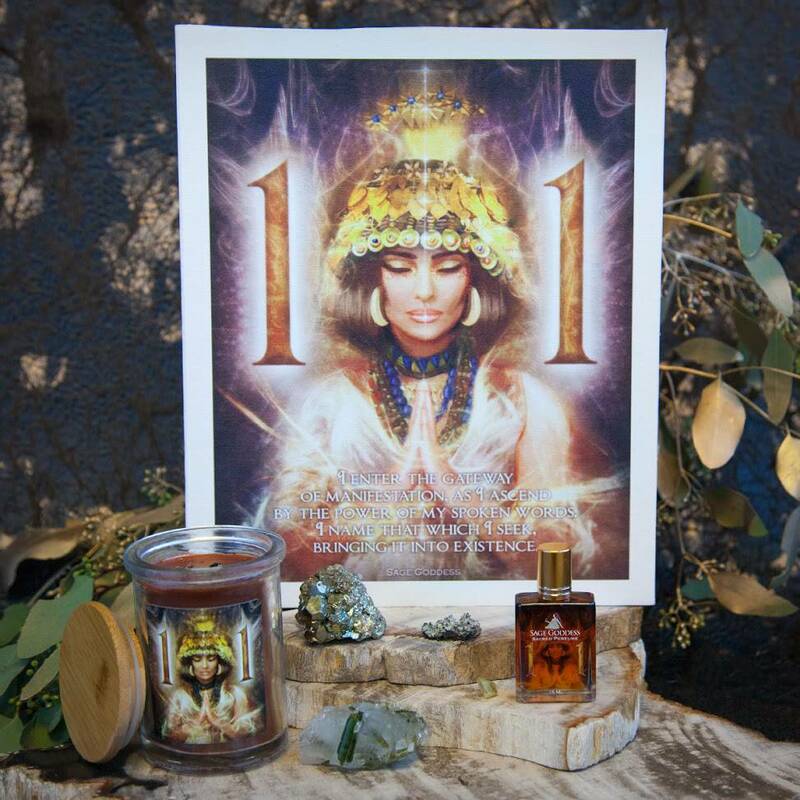 Each sheet of beeswax is anointed with Isis perfume, and your candle will also come with a custom blessing you can recite to invoke her magic. After that is Isis perfume. 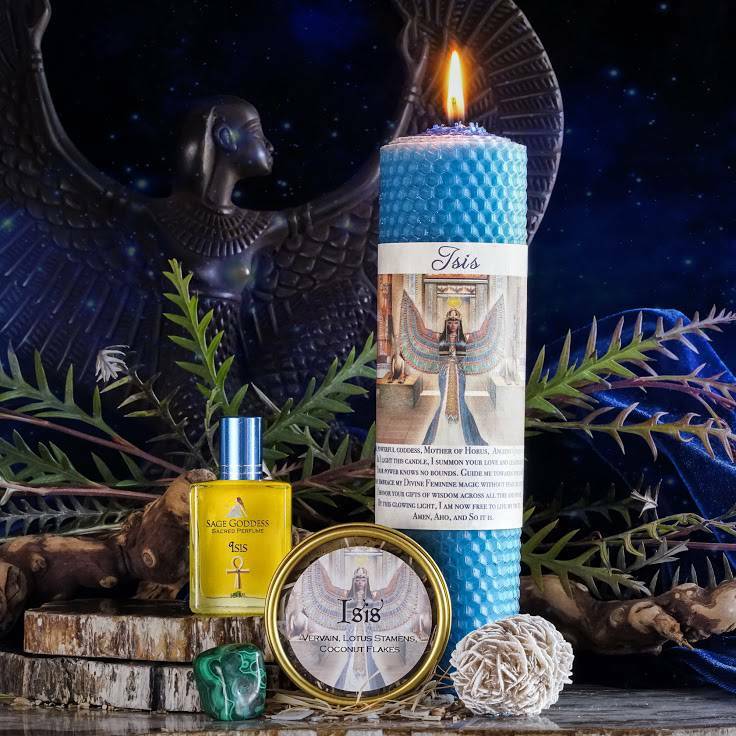 Infused with an amazonite chip stone for heartfelt communication and clarity, and tenderness with the notes of white lotus and pink peppercorn, this empowering feminine scent will have you giving off the aura and aroma of an Egyptian priestess as soon as you anoint with it. 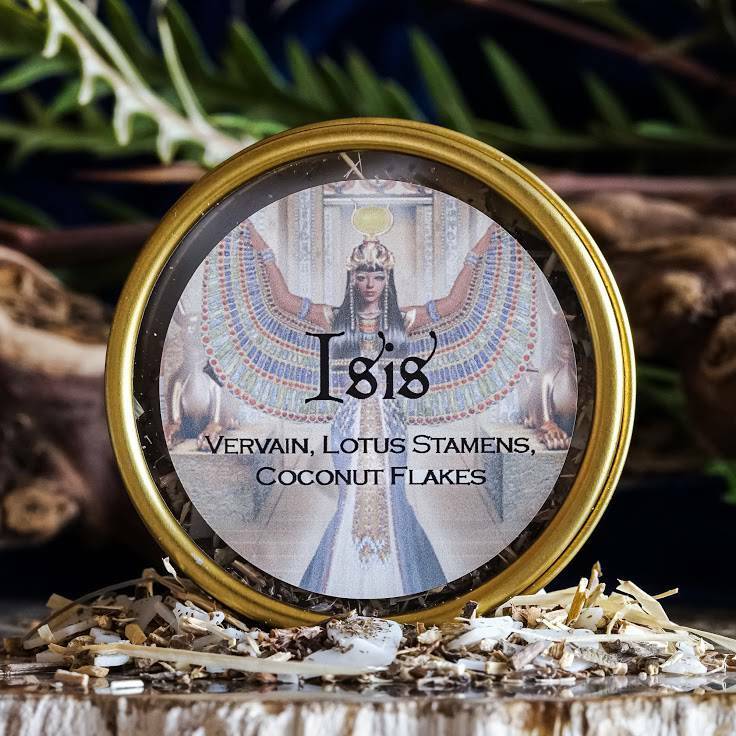 You’ll next receive the herbs of Isis, which include vervain, lotus stamens, and coconut flakes. Sacred to Isis, vervain is a mild sedative, which according to legends was used as protection against vampires and to bring good fortune. Lotus stamens are religious, artistic and folkloric icons known throughout the Orient as symbols of resurrection and renewal. Coconut flakes, and coconuts in general, are associated with protection and purification, as well as water, the moon and the Divine Feminine. 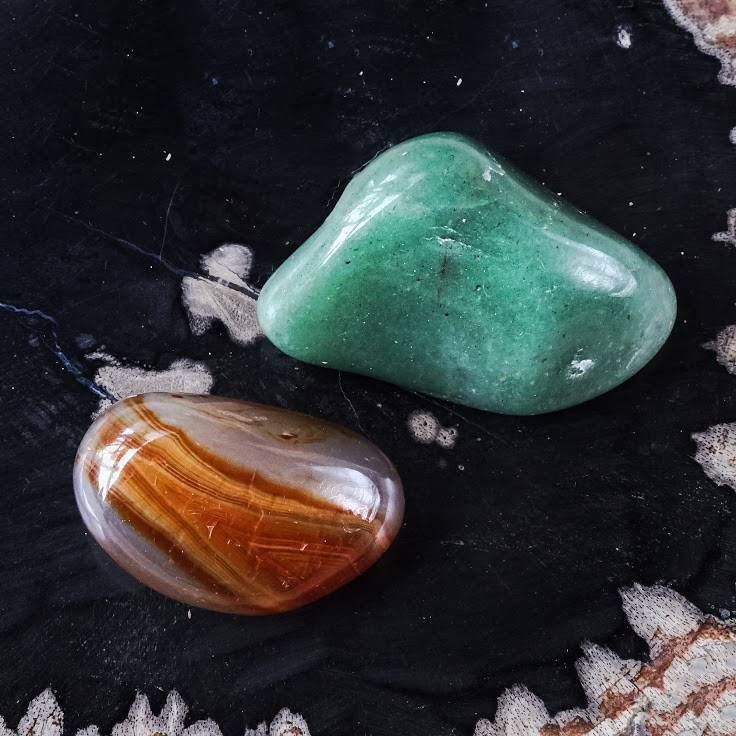 Lastly, the Isis gemstones which includes malachite and desert rose selenite. Malachite is a stone known for its powers to protect the wearer or user from negativity. It fills the auric field with positivity and helps activate one’s psychic radar. 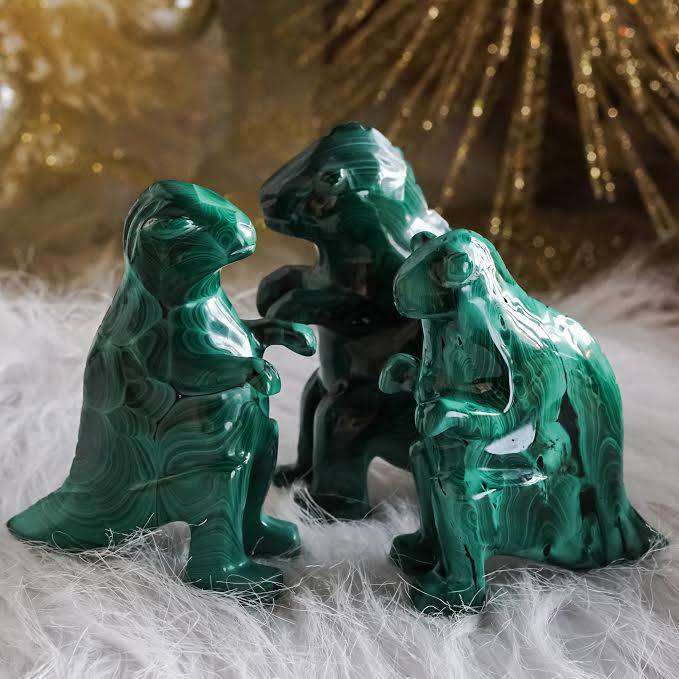 Malachite not only stimulates the Solar Plexus Chakra, activating one’s willpower, but also has a particularly powerful magic over the Heart Chakra. 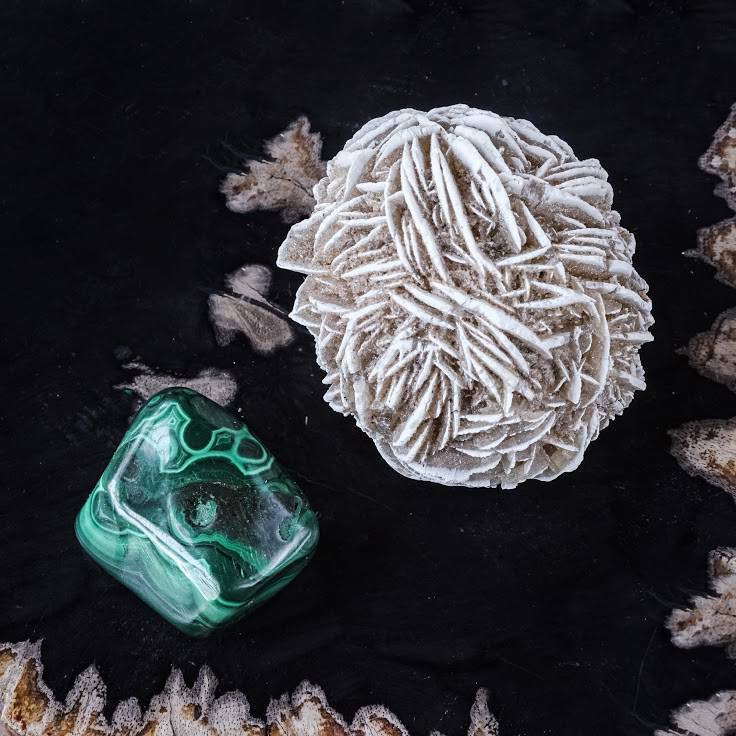 Desert rose selenite is a beautiful flower-shaped stone that embodies the energy of sand in every one of its rose petal formations. This gentle, spirited crystal teaches us to flow with the wind and create landscapes from our dreams. This crystal is excellent for clarifying visions whenever you need to interpret those messages in a flowing way. 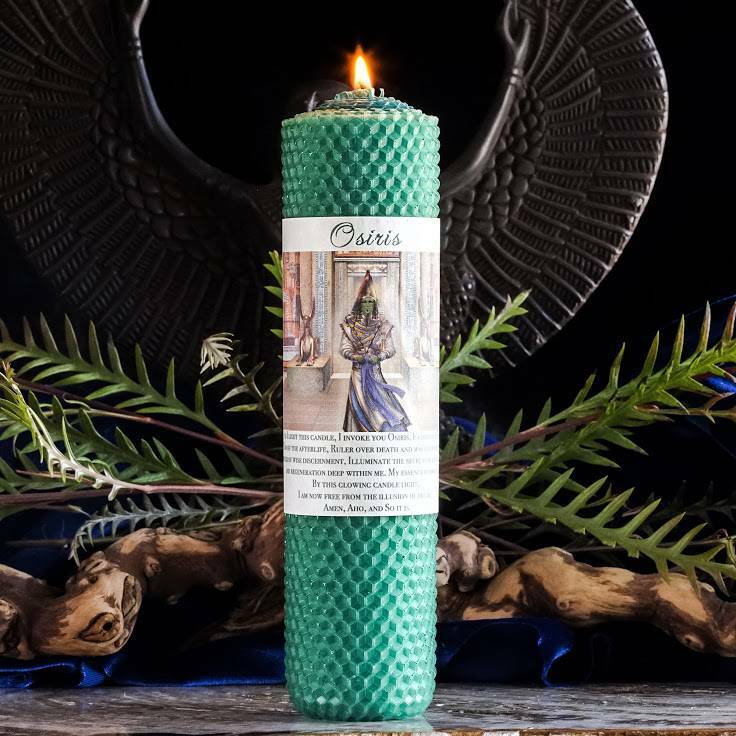 My Osiris set starts with an Osiris pillar candle, made with sheets of organic beeswax in forest green and light green and infused with a labradorite chip stone. 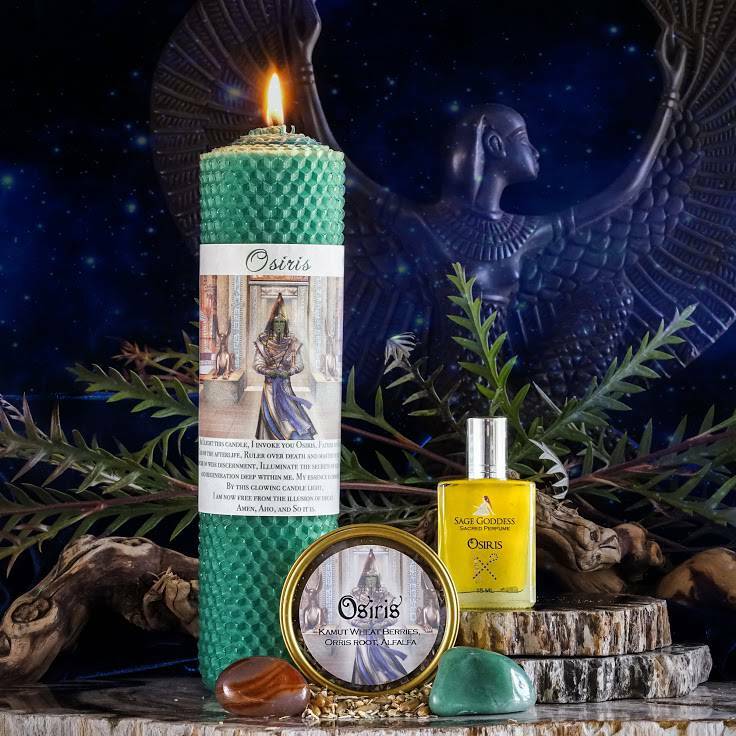 Each sheet of beeswax is anointed with my Osiris perfume, and your candle will come wrapped with a custom blessing you can recite to summon the magic of resurrection and transformation. 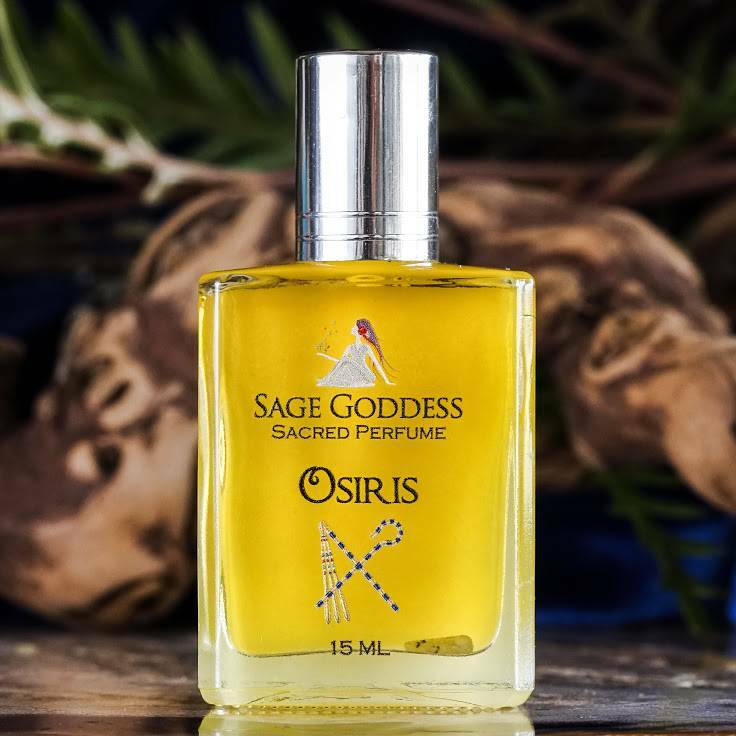 After that comes Osiris perfume, a enlightening blend of Myrrh, Kyphi and Vetiver and embedded with a chip stone of labradorite. Labradorite is the stone of creativity, and is a facilitator of new beginnings, perfect for the full moon in the month of May, and the season of spring. 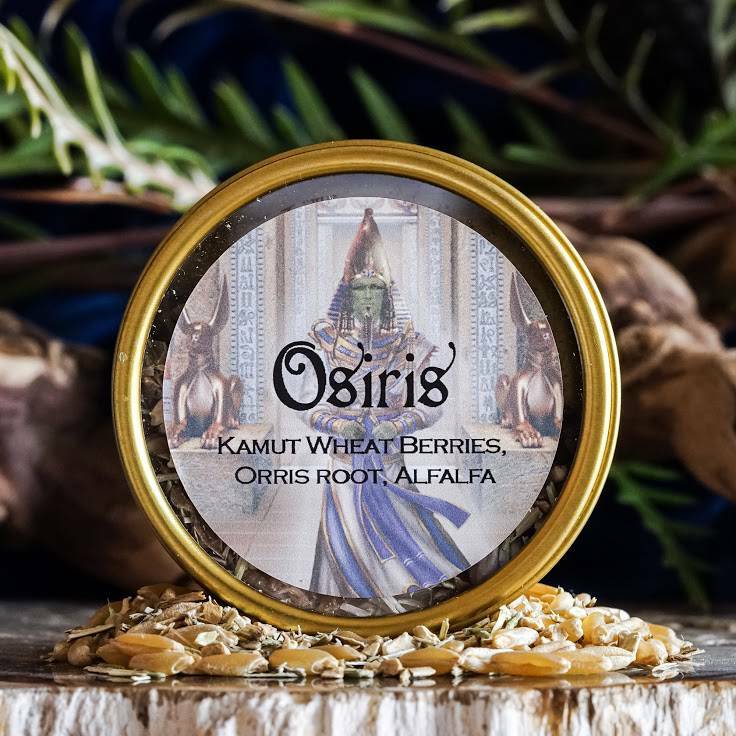 You’ll also receive the herbs of Osiris which include Kamut wheat berries, Orris root, and alfalfa. Kamut wheat berries come from an ancient form of wheat, and many claim that they were found in King Tut’s tomb. Orris root is known as a moon plant, and is excellent for working deep within the subconscious. Alfalfa is one of the oldest plants on earth and is known to bring prosperity and purification. Lastly, the Osiris gemstones include green aventurine and carnelian. Green aventurine is full of the vibrant energies we need to promote growth, prosperity, and spiritual attunement. Its whimsical, cloudy green coloration comes from microscopic fuchsite particles, and as a member of the quartz family, it possesses all the powers of magnification, intensification, and sealing of spells or intentions that we associate with clear quartz. Carnelian offers a major energy boost, while instilling both courage and enthusiasm. It puts you into overdrive, giving you the push you need to get things done and manifest your dreams. Its Sacral Chakra correspondence also activates your sexual passion and your creative force. This stone is passion on fire. This listing is for one (1) Set Honoring Isis and Osiris, or either individual kit. Choose from the drop down menu as you feel called. Your tools will arrive lovingly gift-wrapped for your pleasure and delight. Remember, if you order both kits together you receive a vintage Egyptian papyrus as a gift from us. I bought this set to honor my patron goddess Isis. It was so nice to finally have something made specifically to honor her that I was moved to tears when the package arrived. The candle and artwork are gorgeous and the perfume is so feminine and really resonates with me. In a way, it reminds me of my grandmother even though she never wore anything like it. The only downfall for me is that I’m too sensitive with my allergies to burn the incense unless I place it directly in an open window. Instead, I place it in offering on my altar in front of my little statue of Isis, and when the time comes, I’ll sprinkle it outside and return it to nature. This wonderful kit really pulled to me. 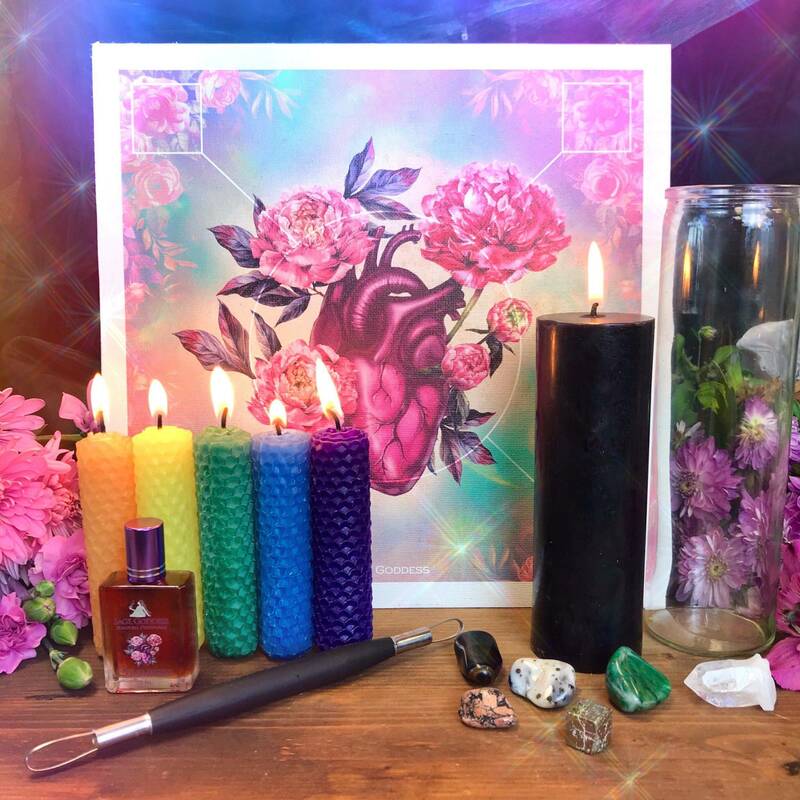 Not only are the colors vibrant but the perfume smells wonderful, the crystals that come with it are an excellent addition to the tool kit and as an overall.. The combined Creative Source this is a wonderful set. I thoroughly enjoy using mine and it is something that with me really resonates. Thank you Athena for making such a wonderful kit. Osiris perfume really really smells truly unique. 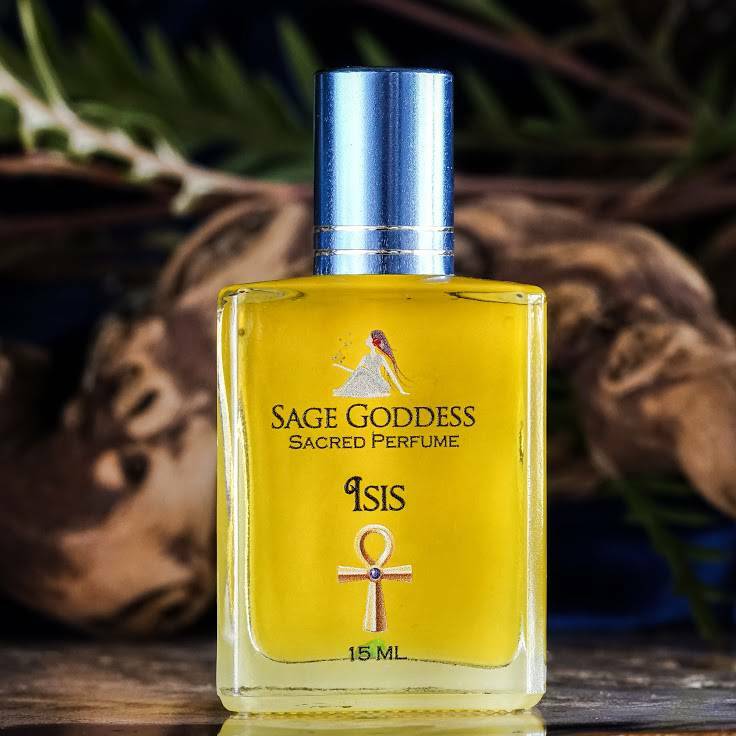 Isis perfume is divine… Both pull at my soul strings. I bought both kits, and couldn’t be happier. It’s wonderful!